What kid doesn’t love magic, in any form? Sure, there’s the lovely, wish-it-were-so magic of Harry Potter and Oz and a million other books, but real-life magicians and their fabulously complex illusions are just as intriguing. This kind of magic also has the added bonus of being REAL, being about human cleverness rather than relying on fantasy. It’s so compelling to think that if only you were smart enough, you could in fact figure out how the trick was done. Well, the Hocus Pocus Hotel series is about that sort of magic, the magic of smoke and mirrors and assistants in sequins, the sort of magic that actually can be explained because it’s about intelligence and talent and persistence. This is the sort of magic, in short, that anyone could (given sufficient time and energy) do. It’s also the sort of magic that anyone clever and determined enough could figure out, which is exactly what the odd couple of Tyler Yu (bully) and Charlie Hitchcock (brainiac) do -- twice. Using their intelligence, powers of observation, and general determination not to be outdone by a blowhard newcomer, Tyler and Charlie figure out how tricks are done, and once again, save the hotel. 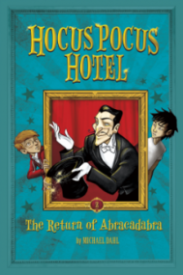 The Return of Abracadabra, the second book in the Hocus Pocus Hotel series, has a distinct advantage over the first, in that we already know most of the cast of characters. That includes the strange and wonderful Hocus Pocus Hotel, which is itself a character in these stories. Because the author doesn’t have to spend time introducing us to anyone, we can just get stuck into the mysteries at hand. Like in the first book in the series, the mysteries here revolve around how a particular magic trick works, and the author, Michael Dahl, is awesome enough to show the reader exactly how these tricks are done. Also, Tyler and Charlie are more comfortable with each other, so they seem more like real people, rather than stock characters. No longer simply the dumb bully and the bright nerd, the pair show each other—and themselves—who they really are, and that’s a kind of magic in itself.